Health systems are founded on the principles of a society. Denmark has equal and free access to hospitals and the healthcare system and spends 9% to 10% of GDP on health care, with revenues from general taxation. There is a high quality of care, free choice of provider and virtually no private hospitals. The municipalities are responsible for district nursing, rehabilitation and children’s health. Denmark is well advanced in its national infrastructure for health IT, primarily because it enables communication between primary and secondary health care. All hospitals, pharmacies, municipalities, and 98% of GPs and 85% of specialists are connected and exchange point-to-point structured patient-specific messages in a closed network. People can see their own health data on the Danish e-health portal, Sundhed. In Denmark, people are accustomed to using computer IT systems to accomplish banking and other tasks, and 98% of all families use computers at home. Each citizen has a single digital signature — a personal number system in use since 1967 — for home banking, taxes and health information, which makes it easy for people to access their own data. 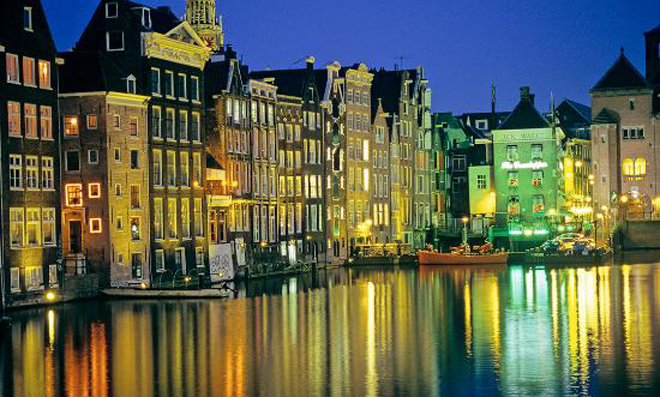 Danes are also used to the state having access to their information. The taxation system is such that people do not even need to fill in a return: the state has all the relevant information and makes deductions automatically. Denmark’s health IT systems were developed through physician-billing systems. At the national level, there has been a central repository for hospital activity since 1977, which contains all the diagnoses of people who have been hospitalized. A central cancer registry has been in operation since 1943. Medcom is an organization set up in 1994 to design the communication system for the national health IT program. The technical and clinical infrastructure is well established, but there is still work to be done on governance and models. 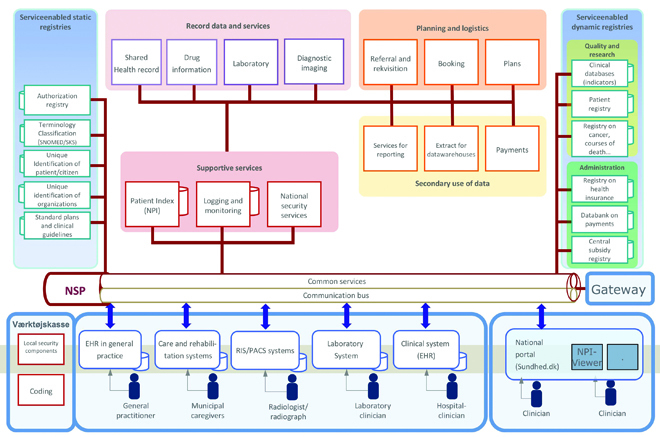 The Danish Health Data Network is a closed network in which data can be sent securely between hospitals, private doctors and services such as home care provided by municipalities. All doctors are somehow connected to this system. The prescription server tracks not only the medicines a GP has prescribed, but also how much medicine has been picked up at the pharmacy. This is important because 10% of all prescriptions are never filled. A national medicine profile is under development that will combine this information with prescription information from the hospitals. People can view their own medication profile on Sundhed. A national patient index is also under development to enable people to view all their information, be it imaging, diagnosis or medication. It will resemble the U.K.’s HealthSpace and should be available within two or three years. Increased productivity is the central motivation behind Danish investments in health IT. The words quality and access are used to get people on board, but there is an urgent need for the health system to be more productive. Doctors are in short supply and recruitment from Eastern Europe is not an ethical way to solve the problem over the long term. The system architecture (Figure 1) starts with a number of different single-data-source systems that feed into a national service platform to communicate that information into different services. The same source data are used for planning, quality, efficiency improvements and innovation. A new agreement on e-health concluded this year will lead to a number of reforms that respond to changes in the health system structure. The counties were abolished and replaced by five regions, entailing a redistribution of responsibility for healthcare services. Another organization is meant to coordinate health care across the municipalities and counties, but it has been difficult to work out a common vision. The regional governments decided to close down Digital Health and set up a clearer division of labour, connections and progress between the different parts of our system. There will be a new health IT advisory board in the Ministry of Health. At a regional level, there should be consolidated EHRs in all hospitals by 2013, and an appointment planning and booking system in place by next year. At the state level, work in the coming years will involve consolidating national health records and ensuring that there is a common and effective exchange of information about a patient: not sending data but rather sharing data. That means standardization and more standardization, employing SNOMED terminology. (SNOMED CT is the systematized nomenclature of medical-clinical terms was originally created by the College of American Pathologists and is considered to be the most comprehensive multilingual healthcare terminology in the world). If data are not structured, they cannot be shared. Denmark does not share the American approach whereby people are responsible for bringing their own health data to the doctor. It is considered the doctor’s responsibility, not the patient’s, to have all the relevant information on hand. Many people cannot take care of themselves, and 80% of all our diseases are chronic. Danes want a system that allows society to take care of them. This culture affects views on privacy. Doctors and nurses need to see patient data in order to provide effective care, but people can opt out if they do not want to share their information. There will be a review of the legal barriers to sharing information, but the general understanding is that if people refuse to share their information, they must assume the risks involved with that decision. 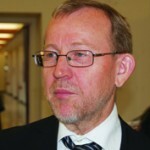 Mr. Otto Larsen took office in the National Board of Health in 2007 as Deputy Director General, and is now in charge of the development of the national organization of Digital Health. Mr. Larsen, a graduate in political science, has worked for the Association of County Councils since 1971 and served as Director General between 1986 and 2006. He has been closely involved in the development of Digital Health on a strategic level and has an in-depth knowledge of the Danish healthcare system, as well as political decision-making procedures at national, regional and local levels.